Sometimes this blog truly is a labour of love, when "labour" is the operative word and there's not much to love at all. Like this week in 1993, which has to go down as one of the worst weeks for a pop fan like me to recap. Not even the debut of a future chart-topping single can distract from the fact that it was a pretty lousy week for new pop music. Rock fans are well catered for, however. The presiding chart-topping single this week in 1993 was still "You Don't Treat Me No Good" by Sonia Dada, which spent its second week at number 1, while their other hit was at number 4. There's very little info about this Australian rock band online - and I'm not 100 percent sure if "Stay With Me Tonight" was the lead track of this self-titled EP. As a song, it sounds like any number of pop/punk tracks from a decade later. Too ahead of their time? Not even the lead single from a brand new album could put Living Colour back inside the top 50, although they came close with this track from Stain. The '90s is littered with rush-job dance remakes of massive hits, and they don't come more awful than this painful version of the ballad recently made inescapable by Whitney Houston. Speaking of terrible and wholly unnecessary cover versions, Radio Freedom tried to do a Rockmelons and refresh the Bob Marley & The Wailers classic. They did not succeed. Number 50 "No Time" by Frente! After flirting with the soothing sax sounds of Kenny G in the past, Australia really got on board with his Breathless album, sending it all the way to number 1. On the plus side, this Grammy-winning slice of instrumental muzak was his only singles top 50 appearance as a lead artist... and only for one week. This breakthrough hit by Woolongong band Tumbleweed isn't so bad, actually. In among the distorted guitars, there's a catchy melody, but just as I paid "Sundial" little attention at the time, I doubt I'll be adding it to my collection now. 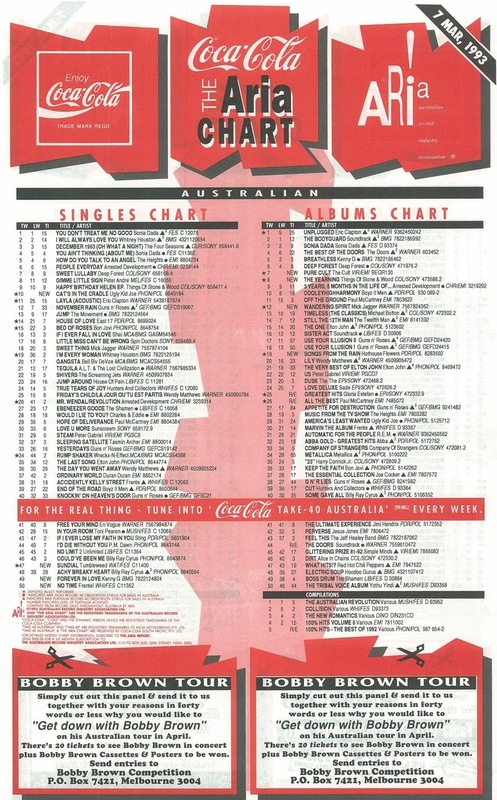 Tumbleweed would go on to have top 10 albums success in the coming years, but this was their biggest hit on the singles chart. 1993 was quite the year for rock bands having big hits with remakes, and there was none bigger than this cover of the top 10 single released in 1974 by Harry Chapin (which came with an apostrophe in "Cat's"). Based on a poem written by Harry's wife, Sandy, the song told the story of the changing nature of a father and son's relationship over time. Save for a few lyrical tweaks, Ugly Kid Joe's version hewed quite closely to the original - just with a heavier rock feel than the folkier original. 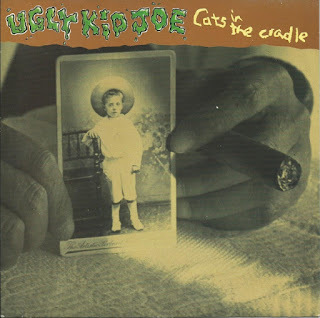 By reaching number 1 in Australia, "Cats In The Cradle" gave Ugly Kid Joe a second - and final - top 5 hit locally. Interesting chart quirk: Harry's original version reached number 6 locally and number 1 in America, while the peaks for this cover were exactly reversed. Next week: another rock band covers a hit from decades past, while another future chart-topper blasts its way straight into the top 10. Other than on the printed chart, I've never heard of Zillian... The corresponding Chartifacts entry from this week's ARIA Report states that the press release describes the lead singer Nick as "exuding that rare sultry quality that drives girls mad". He does kind of have that Home & Away sun-bleached look that was popular then. 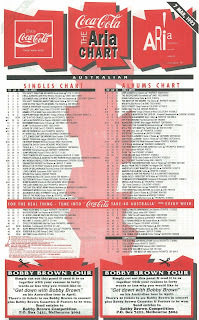 'Leave It Alone' is one of those songs I must have heard/seen once in the rage top 60 and forgot forevermore thereafter. The chorus backing vocals don't sound too dissimilar from Steve Tyler. There was another dance cover of 'I Will Always Love You' by Tears N' Joy, though I think it was out later in the year. Don't think I've heard this Dekko version before. I don't mind 'Is This Love?' for what it is. I thought it was better than 'Proove'. I liked 'No Time' the most from the singles from 'Marvin the Album'; no doubt partly because it wasn't overplayed unlike the previous two. Angie Hart apparently said in a recent-ish interview (I didn't see it) that Frente! lost their indie credibility with 'Accidently Kelly Street', and I think that's definitely true; hence the backlash. Also, they appeared on 'Home & Away', playing 'live' in the surf club, towards the end of March 1993 (the first episode Angel appears), which was a puzzling and misguided move, I think. They were already 'big' and didn't need that kind of exposure (plus it was surely the wrong venue, given their indie-leanings). Maybe it was done to help get them recognition in the UK. My dad bought the CD 'Forever In Love' is from, and I was subjected to it in the background for much of '93. To me, it sounds like the soundtrack to a 'love' scene from an American daytime soap from that era. I actually really like 'Sundial'; mainly for the middle 8 wah-wah guitar instrumental key-change. I love that part, despite generally not being much of a 'grunge' fan at all. Can't say I'm overly fond of 'Cats In the Cradle', but I dislike it less now than I did at the time. Although not being a parent, I can relate to the theme of how quickly time seems to pass as a late 30-something adult. I also still can't figure out, 25 years later, why Frente were written into a Home And Away episode. I mean, at the time, 14 year old me thought it was great; definitely the best gig ever staged in the Summer Bay Surf Club. But I'm guessing that episode was filmed several months before it aired. Not a parent here either, but "Cat's In The Cradle" does pull at the old heartstrings. Also, put in that missing apostrophe Ugly Kid Joe, you're not fooling anybody. Ha ha, I remember that Damien "I'm just watching the clips" moment on H&A in the early years repeat from a few years ago now (already). It's like they were preparing the audience for the Frente! onslaught, including airplay in the diner. It's funny how they did such things, like playing Toni Pearen's 'I Want You' in the lead up to her stint on the show. That "I'm just watching the clips" moment was one of the most puzzling moments on HAA in the '90s I think, but I thought it was great. I didn't know Toni Pearen got Summer Bay Diner airplay. I wonder if Craig McLachlan or Dannii Minogue did in 1990? Imagine Grant Mitchell being in a scene and "Mona" blasting from the jukebox.